Protects against dirt, moisture, and tampering. Superior clarity. 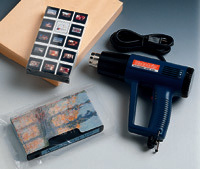 Easy to use - simply insert object between film folds, use sealer (if needed), then use heat gun to shrink material to form a tamper-evident package.